Happy St. Patrick's Day! I decided to make a St. Patrick's Day card for this week's Short & Sweet Saturday card. My upline, Cheri of Cheri's Cards, made a four-leaf clover using the pear punch in the Itty Bitty Fruit Punch Pack (you can see hers HERE), and I decided to make one myself. I made the stem differently than she did, by using the Pretty Label Punch that I used for the greeting layer. I used a few Sale-A-Bration (SAB) items on this card. I used the Springtime Foils Specialty Designer Series Paper from the 2nd Release. I also used the Cable Knit Dynamic Textured Impressions Embossing Folder and Myths & Magic 6" x 6" Glimmer Paper from the 3rd Release. There are two ways you can get these two items. You can pick them as your FREE SAB item with a $50 order (before shipping) or purchase them. In the supply list below, there are two each of these items. The first one is for the SAB way to get them, and the second one is the purchase way. Don't Forget - Sale-A-Bration ends on March 31, 2018! Springtime Foils Specialty Designer Series Paper (DSP): 5-1/4" x 2"
Silver 3/8" Metallic-Edge Ribbon: 7" & 5"
Emboss the largest Whisper White piece by running it through the Big Shot with the Cable Knit Dynamic Textured Impressions Embossing Folder. 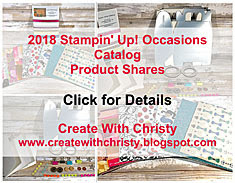 Cover the DSP piece with Emerald Envy ink from the Emerald Envy Classic Stampin' Pad using a Sponge Brayer. Wipe the foil design on the DSP to remove any ink that might be on the foil. Attach the piece across the top of the Whisper White embossed piece. Wrap the 7" piece of Silver 3/8" Metallic-Edge Ribbon around the bottom edge of the DSP layer, and attach the ribbon ends to the back of the embossed layer. Fold the Emerald Envy piece in half (fold on the top) to form the card base. Attach the embossed/DSP layer to the card base. Stamp the "May your troubles..." stamp from the Barn Door Stamp Set onto the small Whisper White piece using the Basic Black Archival Stampin' Pad. Punch the greeting out with the Pretty Label Punch. Insert a scrap piece of Basic Black Cardstock into the top portions of the Pretty Label Punch, and punch. Insert the piece back into the punch, inserting the curved edge in first , make a narrow sliver show, and punch. Cut the little curved sections off both ends to form the stem. Put some SNAIL Adhesive along the bottom end of the stem, and attach it to the top, right corner of the greeting label. Attach a small faceted gem from the Gold Facted Gems onto each side end of the label. Put two Mini Stampin' Dimensionals on the back of the label ( one on top and one on bottom). Remove the paper backing, and attach it to the left side of the card, over the ribbon. Punch out four pears out of the Myths & Magic Glimmer Paper piece using the pear punch from the Itty Bitty Fruit Punch Pack to make the clover's leaves. Put a Mini Stampin' Dimensional onto the back of each one, and attach them to the top of the stem into a four-leaf clover shape (see card picture on the first page). The stems of the pears should overlap in the middle, over the stem's top end. Tie the 5" piece of the Silver Metallic-Edge Ribbon onto the right side of the attached ribbon using a single knot. Trim the ribbon ends at an angle. If you have trouble opening the tutorial, make sure you have an updated pdf reader. 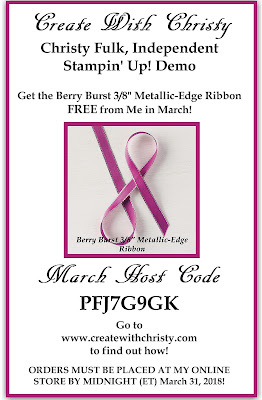 Get the Berry Burst 3/8" Metallic-Edge Ribbon from the Occasions Catalog FREE with a qualifying online order in March from me! Offer ends @ midnight on March 31, 2018. Click on the picture to find out how you can get it, and to see the thank you card (with instructions) you'll get, too! Sale-A-Bration Third Release Starts Today! More Sale-A-Bration Products Available March 15!